At Orthopedic Specialists of Connecticut, we are passionate about working with our local communities. 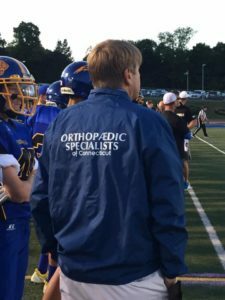 Our commitment ranges from serving as team doctors for sports teams in Ridgefield, Brookfield, New Fairfield, and South Kent to our advocacy for the local Arthritis Foundation. As Safety Director of Ridgefield Little League in 2007, Dr. Fish lobbied to have AED’s (automated external defibrillators) installed at baseball fields – and then required that all coaches be trained in their use. Dr. Gupta recently helped the Arthritis Foundation exceed its fundraising goal in our area. As a physician who spends much of his time helping people and their families deal with arthritic pain – the number one cause of disability in America – he wanted to do more to support the cause. After a lot of trial and error I found Dr. Fish he was fantastic. After three specialists he was the first to take his time and explain to me exactly how MY KNEES worked not someone else's. This allowed me to make the best educated decision on next steps. You can research all you want but it's important to know how you work as every person is unique. Dr. Gupta is the very best in knee replacement surgery! Thank you! Dr. Daher took care of me with my meniscus tear this past year! He did a wonderful job with explaining what the surgery involves and did it with care. Thank you Dr. Daher! Dr. Gupta is the only physician I'd want for any orthopaedic concern. He's exceptional in that he genuinely listened to my questions and concerns and went on to answer in ways I could understand. The Office Staff provided excellent, friendly and efficient service and made me feel cared for and respected. Our daughter is a Division I gymnast who has been treated by Dr. Fish since the age of 7. She had a serious knee injury in 2016 which required two surgeries and thanks to Dr. Fish, a wonderful person and an amazing surgeon, she is back 8 months later as a competitive gymnast. Could not be where she is without him! Starting with my first call to schedule an appointment I have received nothing but courteous, friendly and professional care from everyone in the office. Dr. Daher explained my rotator cuff issue in simple, easy to understand terms. He explained everything that I could expect from the pre-surgery testing to the post-surgery follow-up. I recently completed my fourth, and final, post-operative office visit and the quality of my care has been consistently excellent throughout. I would happily recommend Dr. Daher and his staff to anyone needing orthopedic care. Dr. Fish is the best of the best! He has been caring for my family's orthopedic problems for many years....from simple Cortisone shots to complicated surgeries to repair fractures. The staff, including PT experts, are all great. Would never go any place else for our ortho needs. I have been going to this practice for many years. I use to see Dr. Nipper until he retired and now I see Dr. Fish and he is the best! He takes his time with you and explains in detail what is the problem and gives options on how to treat. He has excellent bedside manners. Dr. Gupta was my surgeon for both my hip replacements. My right side done Dec. 2015, my left side done Oct. 2016. He and the ENTIRE staff at OSC are FANTASTIC!! I have had other Orthopaedic surgeries (knee & foot) before finding Dr. Gupta. OSC is second to none! Just had my 6 month follow-up and do not need to come back for another 2 years. I will actually miss my visits to this office. You will NEVER find better doctors, x-ray techs, front desk, check out desk, PA's, nurses, billing staff etc etc etc anywhere!!!! Thank you OSC I am truly grateful for you all!!!!! Dr. Gupta performed arthroscopic knee surgery for me on April 26th, 2017. I am so pleased with the GREAT job he did. I only had very slight pain for about a day and from then on it just gets better everyday. There was a little stiffness in the first few days which is very quickly going away. I can walk a normal heal to toe with no pain. I did exactly as instructed which was to not stress the knee too much and to ice it three times a day. I can't say enough good things about Dr Gupta. He is a wonderful surgeon and I would recommend him to anyone. You will be in good hands. I went to 2 different doctors before seeing Dr. Gupta. I was not happy with the others, They were both a little full of themselves. Dr. Gupta took time to explain everything I needed to know about the surgery. He Made me feel like I was the only patient in the office. The entire staff at Orthopedic Specialists treated me the same way. They are all friendly, professional and courteous. A special shout out to the Surgical Coordinator. She never lost her cool as Scheduled my surgery, called back to change the date, than call back and change it back to the original date, all within 2 days. Thank you for that. I would Highly recommend Orthopedic Specialists. Dr. Gupta is the only physician I'd want for any orthopaedic concern. He not only explained the mechanics of the arthritis in my left hip he showed me the x-rays of both hips so that I could clearly see the condition of my arthritic affected hip. He's exceptional in that he genuinely listened to my questions and concerns and went on to answer in ways I could understand. The Office Staff provided excellent, friendly and efficient service and made me feel cared for and respected. Everyone in the practice deserves to be commended! I highly recommend Dr. Paz! In treating my mom, he was exceptional in what matters most in a doctor. He has a big heart, is compassionate & caring. It was great to have a confident doctor, dedicated to helping a senior feel her best. He is knowledgeable & thorough in his explanations & takes time to listen. His staff exhibits the same level of professionalism. They are friendly & patient. You leave feeling more like family than a patient.